As a category of collectibles, petroliana is actually a subset of advertising memorabilia and it usually falls under the “mantiques” umbrella as well. Within the petroliana subset, you’ll discover a vast array of gas station antiques and collectibles. These can range from colorful signs and old motor oil displays, to glass globes that once sat upon old-timey pumps (like the one shown here), and collectors outfitting vintage garages and man caves will pay dearly to own some of this stuff. But you have to be careful when it comes to fakes and “fantasy” items that were never originally made when valuable antiques are concerned, and petroliana is no exception. There are also reproductions that are made “in tribute” to originals, that can fool collectors when they’re just getting started. Buying from experienced dealers who have a good reputation is one way to protect yourself in this arena, and studying to hone your eye for genuine articles helps as well. Consider Warman’s Gas Station Collectibles (Krause) by Mark Moran as a good starting point in terms of book learning. 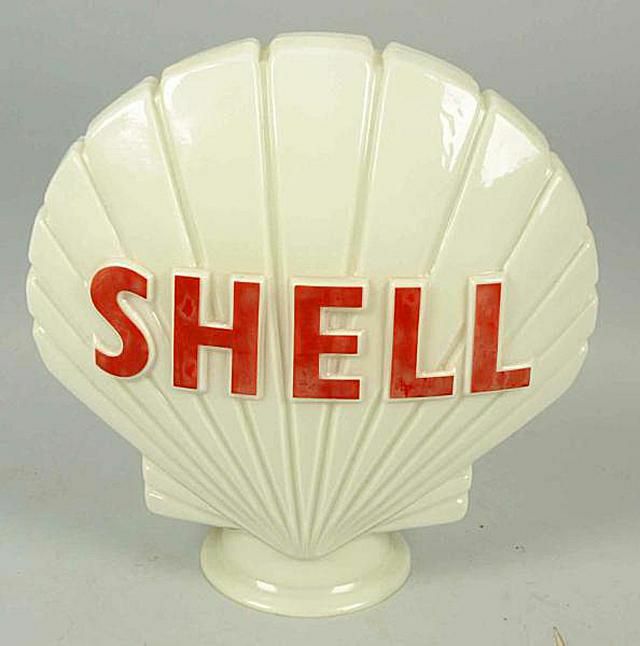 This early figural Shell gas pump globe is in very good to excellent condition with slight fading on the lettering and overall light wear. Measures 17 1/2" tall. Sold for $570 (not including buyer’s premium) at Morphy Auctions in February of 2014. Had the lettering not been faded, it’s estimated that a globe like this would sell for 50 to 100 percent more. Even though this restored gas pump made by Tokheim has a reproduction globe and decals along with condition issues such as a small scrape next to the sale viewer and a repair to one of the glass panels, it still brought a good sum at auction. Measuring 74” tall, it sold for $2,500 (not including buyer’s premium) at Morphy Auctions in January of 2015. If the globe and decals were original, the price could double on an interesting pump of this nature. The quality of the restoration on these pumps also plays a big part in their value. Continue to slide three to see how much a near mint condition Texaco Motor Oil sign is worth. This sign sold for a high price for a reason. Unlike most porcelain gas station signs, it is in near mint condition. Being that these types of signs were actually used in gas stations, and often exposed to inclement weather, it’s rare to find them looking this good. This 23” x 18” sign sold for $1,500 at Morphy Auctions in May of 2015. Take a look at the Pickers Pocket Guide to Signs (Krause) by Eric Bradley for more information on grading signs and petroliana-related examples along with many others. Continue to slide four to see how much a Quaker State oil can rack is worth. This Quaker State Motor Oil rack is holding original cans from different periods. Both the stand and oil cans are all in good to very good condition. This setup sold for $390 (not including buyer’s premium) at Morphy Auctions in October of 2014. Older revolving racks can sell for three to four times this price. If you glean one thing from his slide show it should be that everything, right down to a single vintage oil can, can hold some value when it comes to petroliana. Be sure to research the item, taking into consideration the popularity of the brand with collectors, and adjust for any condition issues present when determining values of gas station memorabilia, and oil and gas advertising items.